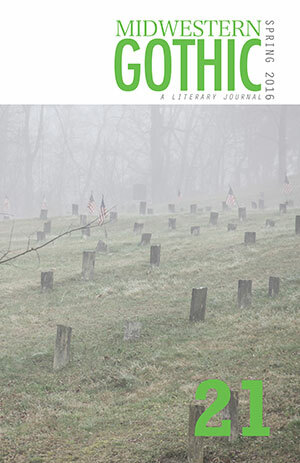 Midwestern Gothic – A Literary Journal » Blog Archive » Issue 21 is Now Available! We’re thrilled to announce that Issue 21 (Spring 2016) of Midwestern Gothic has arrived! This issue marks our 5-year anniversary, in addition to new work that explores urban and rural, fractured settings, and nostalgic memories from exciting voices in the region. Issue 20 features fiction from: Nina Buckless, Carrie Cook, Curtis Dickerson, John Fino, Zachary Gruchow, Rachel Hall, Perry Janes, Gwen E. Kirby, C. William Langsfeld, Matthew Olzmann, Gregg Sapp, John Scaggs, Jill Stukenberg, Amy Weldon, Kate Wisel, and L.L. Wohlwend. Plus poetry from: Alina Borger, Danny Caine, Fiona Chamness, Andrew Collard, Andrew Malcolm Dooley, Trista Edwards, David Hamilton, Dennis Hinrichsen, Rochelle Hurt, Michael Lambert, Michael Lisieski , Caitlin Cowan, Mark Ramirez, Lee Colin Thomas, and Sarah Ann Winn. Or subscribe and save up to 33%!